The tone and the attitude of these types of statements make it seem like we need to put on our armor and prepare for the inevitable sugar plum fairy battle ahead of us. Why is this? Why have the holidays become overwhelming for us? No doubt, the materialization of the holidays is a factor. There just seems to be so much to do… and buy. The week before Christmas brings panicked shoppers to the mall, fighting for parking spots so they can frantically shop for their friends and family as the Nutcracker and Mariah Carey play hauntingly in the background. And there is also an expectation around the holidays that sometimes become hard to live up to. We have to do all the holiday things: red Christmas cups, decorating the house, ice skating, Christmas cards, shopping, holiday parties—all while attempting to continue to live lives that are undoubtedly already busy with work and family commitments. And on top of it, all of these extracurricular holiday activities are supposed to make us feel holly and jolly. It all begins to feel like work. And you might not be feeling holly and jolly. A lot of holiday stress comes from feeling out of control and overly busy. The most practical approach to fixing this is by planning ahead and being organized. 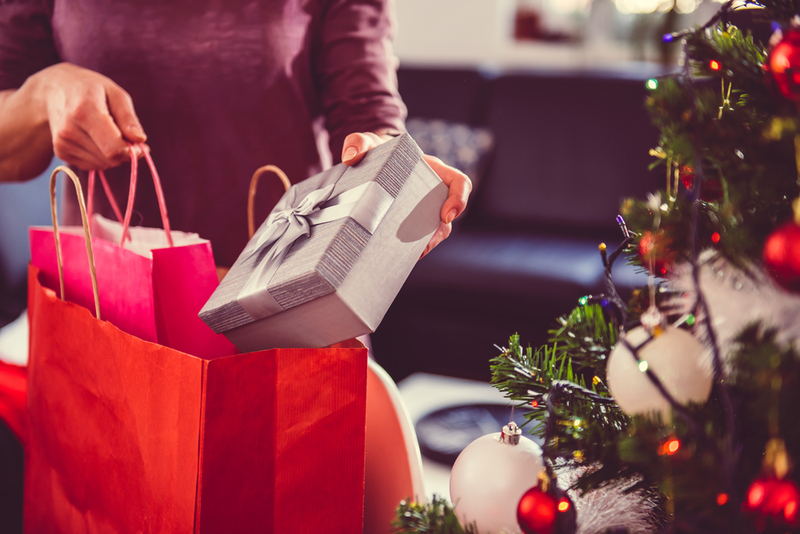 If your work schedule doesn’t allow for you to get to the mall for all of your shopping, make a list of all of your friends and family and shop online. As you order, check people off your list and systematically work your way through. There are even options for your present to be delivered to a loved one fully wrapped and ready to go. Avoid last minute, desperate trips to the mall. Pick and choose what activities you want to do this season, and stick to it. Do not feel pressure to do them all. Give yourself permission to lovingly decline invitations to events or activities that make your schedule and life more stressful. If you feel like you don’t have any down time or time to yourself, you’re trying to fit too many activities into too little of a time frame. Try not to compare yourself to others and create a holiday experience that fits your family and your pace of life. Just because it looks like your friend on Instagram has the perfectly decorated house full of kids in holiday pajamas drinking hot chocolate after a day of ice skating and watching the Nutcracker, it doesn’t mean that they are winning at the holidays. Try not to compare yourself to others and create a holiday experience that fits your family and your pace of life. For some, the holidays might bring sadness and grief over a lost loved one or an estranged relationship to the surface. Hearing Bing Crosby sing the words, “I’ll be home for Christmas,” might make you tear up in the car on your way home from work, knowing that you won’t be able to be home for Christmas. Or seeing a happy family drive home with a Christmas tree on top of their car might bring the sting of pain over the loss or lack of a family of your own. Don’t bury these feelings and face them alone. Acknowledge them, share them with a close friend or family member or even talk to a therapist about them if you feel that you can’t shake feelings of depression or anxiety. Be open to getting the help you need to make the holidays a time of love and happiness, not anxiety and pain. Candy, fudge, gingerbread, cocktails, turkey and stuffing—the holidays can seem like a marathon of eating, drinking and late-night holiday parties. Be intentional about putting your health first and not derailing into a “treat yo’ self” mentality every day. Say no to the candy in the break room at work, but say yes to mom’s special fudge. Have a salad at lunch, but indulge in the turkey dinner on Christmas night. You’ll feel better if you stay committed to your normal, healthy lifestyle and habits as much as possible. Don’t let the holidays become work. Don’t let them become stressful and anxiety-inducing. Instead, commit to making a plan, being intentional and practicing self-care. With intentionality and thoughtfulness, you can find true peace and joy during the holidays.